The new year is here and it’s that month of resolutions and goal setting and deciding all the changes we are going to have in our lives in 2018 and how much better everything is going to be. For me it’s that month that I try to make some healthier eating choices that I know I can stick with all year long. No fad diets, no crazy food restrictions, none of that works for me. 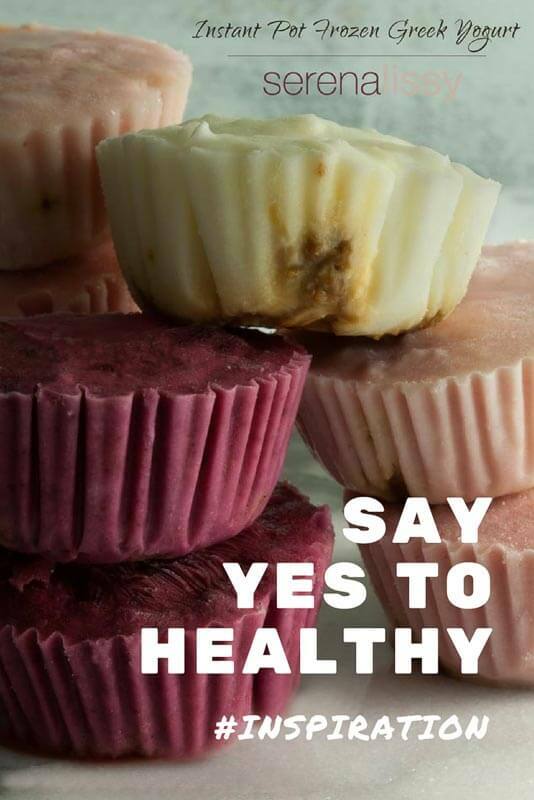 I just try to incorporate a few more healthy eating choices that I love and I know I will stick with. I plan a few half marathons that I want to run for the year and maybe a few distance bike rides but nothing extreme that I know I will give up in February. I’ve been eating yogurt all my life. I’ve seen a few recipes out there for the Instant Pot so I figured I’d give it a try. At first I didn’t see the logic. By the time I buy my starter and my milk, why didn’t I just buy a container of Chobani? I probably go through one container every two weeks. I’m the only yogurt eater in the house. Not that expensive of a food habit for me. But then after reading quite a bit on it, I saw people were going through containers (yes more than one) in a week’s time. And if it’s a family of yogurt lovers then multiple containers per week. Ok, cha ching. I got it. Then, I started looking at the recipes. They were almost all the same. A half gallon of whole milk, two tablespoons of yogurt starter. Not much change no matter where the recipe came from. I did five tests this week with different milk brands, and different yogurt brand starters. What I didn’t want to do was post a recipe that was impossible for people to find the ingredients. The extra fat milks, the hard to find Greek yogurts that make the best starters. What I wanted was a simple yogurt that anyone with an Instant Pot could make and love. There are basically 5 steps to making Greek yogurt. Every yogurt recipe I made turned out. I’ve seen a few disasters on blog comments about the yogurt not turning out for whatever reason. Now some yogurts were thicker than others and some had a more tangy taste than others. I cooked all recipes for 10 hours. No change on that. I was surprised the tanginess of the flavors and how different each starter was. For me I found the best milk to work with was the Horizon Organic Whole Milk brand, whole milk. I favored the tangy taste that I got from the Chobani whole milk Greek yogurt. We tried Fage, Dannon and Chobani starters. Whichever one you decide to use MUST HAVE active live cultures in the ingredient list. Those little cultures are your starter and without them, you will not be making yogurt. Now when you finish making the recipe you will have yogurt. From all the reading, what makes it Greek Yogurt is the straining of the whey out of the yogurt. Both ways were good for me, but I preferred to strain to get a thicker yogurt. It just felt creamier, and in my mind at least, had a richer taste. Any yogurt experts out there? Anything else to add as to the difference between yogurt and Greek yogurt? Please share if so! For the straining I used a cheesecloth. I folded it and lined a strainer and let the whey drip out. I did this for about 4 hours. You could also use a coffee filter. Cheaper than a cheesecloth and will do the same job. The Euro Cuisine GY50 Greek Yogurt Strainer is a bit fancy and will definitely do the job. But if you have a simple strainer basket it works fine. There are all kinds of special yogurt strainers out there, but I already had this and it worked fine. Once I had the yogurt I loved, then what else could I do with it? I love fruit in my yogurt so I whipped up some fruit purees (whole fruit mixed in a food processor until liquid) and started adding. I’m now experimenting with some no bake cakes and a few other things. I decided to use some of my yogurt to make these yogurt pops. And here is the thing, remember, they are frozen. You don’t take an ice cube out of the freezer and bite it in half do you? 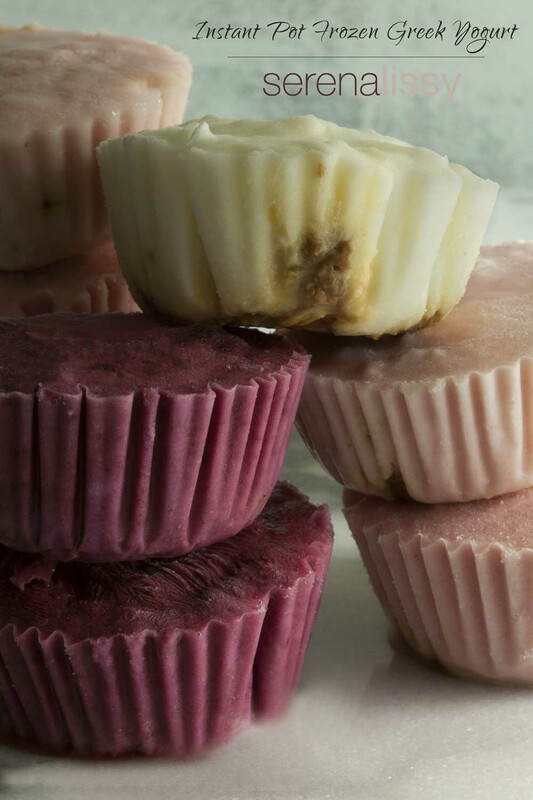 Take these out of the freezer and let them soften a few minutes before trying to eat. The key is to keep them thin and not make huge pops. The image you see of the pops is a half filled baking cup. These are on the verge of too thick. 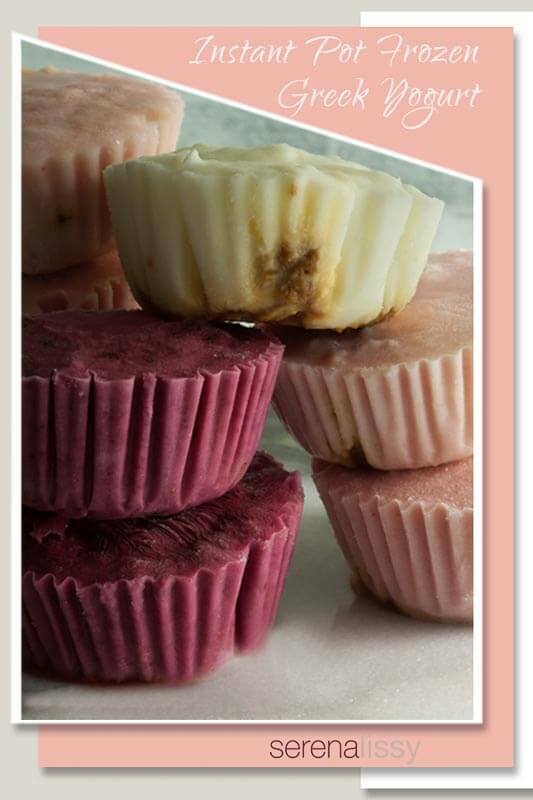 I also learned that the Wilton Silicone Baking Cups are so much better to work with than paper cupcake liners. The paper liners were hard to get off the frozen pop. Once they thawed enough to remove all the paper, then I could just put them in a bowl and eat with a spoon. 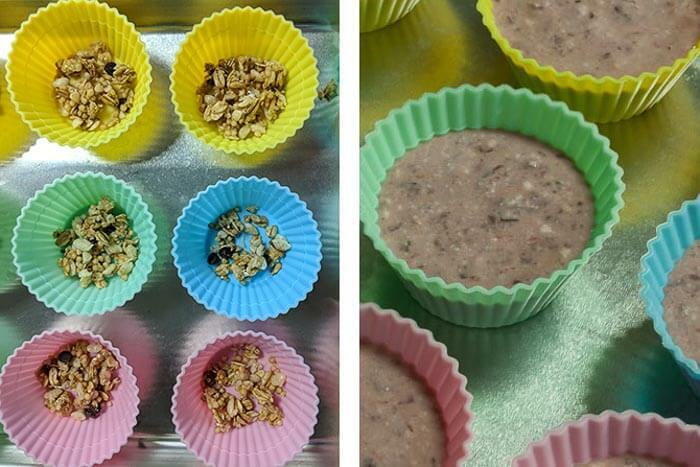 I made granola for my yogurt pops, but any granola you love will work for this recipe. For the timing of the cook, you saw the part were I cooked it for 10 hours, right? And there is some prep before that to heat and cool the milk, so add on another hour. Either plan to make this first thing in the morning when you get up, or last thing at night before you go to bed. Poor timing will have you awake in the middle of the night dealing with your yogurt. I hope you give this a try. It’s simple and so good for you. Please share any yogurt creations you end up making. 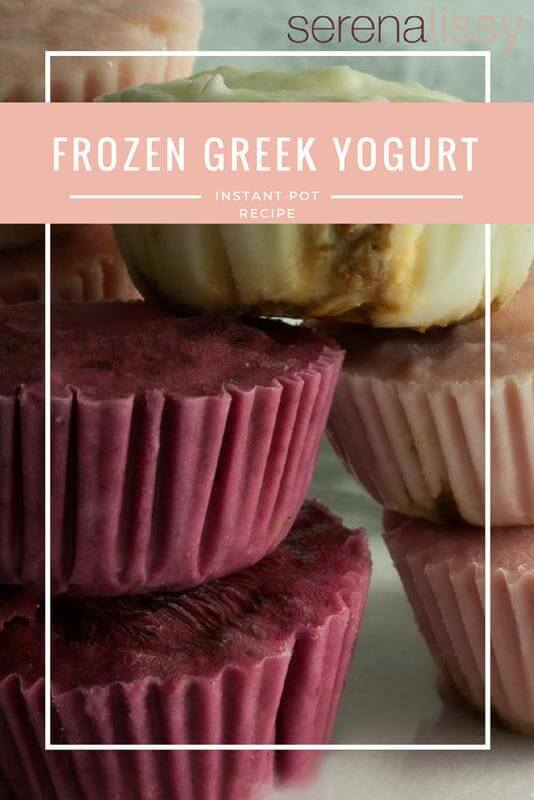 Now if you find that you aren’t ready to go with yogurt we have a few other Instant Pot recipes that everyone seems to love. The Triple Chocolate Cheesecake is my favorite followed by the Peppermint Bark Cheesecake. Put milk in Instant Pot and use the Yogurt More Function to boil the milk to at least 182°F. The instant pot will show "boil" on the screen. It takes close to 30 minutes for this. Once the boiling is done, the Instant Pot changes to "yogt". Lift the lid, do not let the water drip back into the pot. Put 35 grams of yogurt into a 2 cup measuring cup and set aside. Take the pot out of the Instant Pot and set it aside to let it cool to 111°F. Once cooled, skim the milk skin off of the milk. Add 1/2 cup of the cooled milk to the yogurt in the measuring cup. Stir to dissolve. Once dissolved, pour the mixture back into the inner pot and gently stir. Again, do not scrape the bottom. Put the inner pot back into the Instant Pot and close lid. Press the yogurt function button and use the Yogurt Normal Function. Adjust the time to 10:00. This is the time that I used, if you like really tangy yogurt you can go up to 12:00 hours. If you like less tangy, you could reduce to 8:00 hours. The timer will start to count up once turns on. Once the yogurt has completed the time, remove the inner pot and place it in the fridge for a few hours covered with plastic wrap. The yogurt will also thicken some. You can eat the yogurt at this stage. Or if you want Greek Yogurt you will need to strain out the whey. I strained for 4 hours. Once strained I used 8 ounces of the yogurt with 3 ounces of puree. Mix them together then pour mixture into silicone cups with a bit of your favorite granola sprinkled in at the bottom. Put in freezer for a few hours and enjoy. You could also add vanilla and honey to your liking with the fruit puree. Oh neat. I had no idea I could make yogurt in my Instant Pot. I Need to try this because I eat lots of yogurt! This is such a great idea! I’ve been wondering about making yoghurt in my Instant Pot but I’ve always thought it was too complicated, now I know differently I’ll have to give it a go! I seriously need to get myself an instant pot! Seeing this,as well as other recipes, this looks so delicious! Perfect timing! I need all the healthy recipes I can get right now. Can’t wait to try making yogurt in my Instant Pot! What a clever idea, I need to try this at home. I need to get me one of those Instant Pots, everybody is making super tasty recipes with them. I’m seeing so many yummy things from the instant pot. We eat a ton of yogurt in this house. I have heard such great things about the Instant pot I am adding it my list of must have items now. You could pay for the instant pot just with yogurt savings over the year! Definitely worth it if you guys eat tons of yogurt. I’ve never thought to make yoghurt in a pressure cooker before, thanks for the idea! I absolutely love my Instant Pot and am always looking for new recipes to try…haven’t attempted anything even close to this so now I’m completely intrigued and excited, can’t wait to try!! I want to make one for my family! I found it delicious and much more healthy! thanks for sharing this! I wouldn’t have thought that you could make yoghurt in an instant pot. Yummy. So simple and just a couple of ingredients. I’m only disappointed I didn’t try it months earlier! I feel like such a slacker my son loves yogurt but I only give him store bought french style. This recipe does not look that hard but I first need to get an instant pot. It does look like it is worth the effort. Definitely not much effort. Just takes some time for the process. I’ve heard people make Greek yogurt but I never thought about making it myself. I think it’s easier when you have an instant pot though, because I’ve seen instructions for making it without one and it’s definitely tricky. Gotta say it’s pretty simple with the instant pot. It has literally never occurred to me that I could make my own yogurt – which seems crazy, because we eat so much of it in our house! I have an Instant Pot arriving from Amazon this week, I’m going to give this recipe a try! OMG, yum! 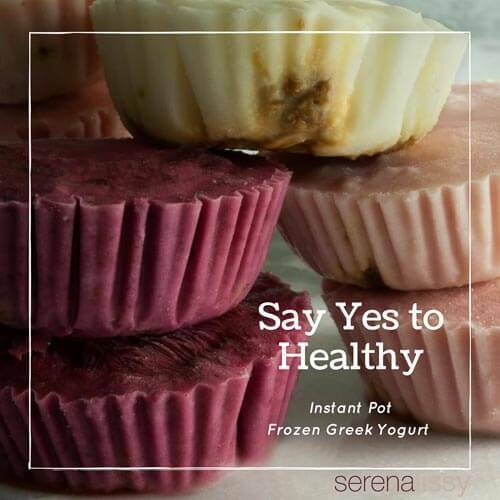 My family loves going out for frozen yogurt, so I’m definitely going to try to whip a few of these up — saves money and seems even healthier! Definitely saves some money. Keep in mind this is preservative and chemical free, so it may be a bit more firm than what you would get at a yogurt shop. Yuummm!!!! Would love to make this for my son. The recipes are not bad at all. These look so yummy! I eat a lot of yogurt and these would make a wonderful snack for me! I appreciate this post. Making yogurt is something that I have had on my mind and this gave me a quick understanding of the process. It doesn’t sound too hard! I need an insta pot! I keep seeing all these amazing recipes and things I didn’t know you could make with one! I have made yogurt a few times. The Instant Pot definitely makes for an easy process. Thanks for sharing! Wow! You really can do everything in the instant pot! I would never dream to make my own yogurt, but you make it sound really easy! I’m always amazed what that little gadget can do! Yogurt in the instant pot?!! Wow! That looks really delicious! I think I need an Instant Pot in my life. I definitely need to try and make these! The husband and I are trying to get healthier this year and these seem like a great snack! Even if you don’t freeze it, its great for so many things. I just love tossing in the puree and thinning it out enough to make it a drinking yogurt. Oh what a great idea! I need to get an instant pot, and I for sure will have to try to make these. Think they’d be a huge hit in my house! I got an instapot for Christmas…I can’t wait to try it. This looks like a recipe that my kids would enjoy. What a great recipe for the Insta pot!! Making yogurt has always been daunting to me but this looks easy easy! I can’t believe how easy these are to make and they look delicious. I think my guys would love to sample these if I had them here at home when they got home from school. Super easy and a great healthy snack. Yay! I am so in love with the Instant Pot and am always looking for new recipes. Can’t wait to try this one out for my kids. I don’t have an Instant Pot, but it sounds like a need one. I’d definitely make this if I did! Instant Pot stuff is one of the things that I am looking to do more of this year. I need to bookmark some recipes like this one and take the plunge. I have an instant pot but haven’t used it nearly enough. This looks like a great recipe to get it out again and used in my kitchen for a great start to 2018! Once you make the yogurt, can you mix it with mint flavor and chocolate chips then freeze it in popsicle’s? I have been waiting to try it but been gun shy.